HISTORY From a historical perspective, the vast lands in which Turks existed, starting from pre-historical times have been places where great civilizations have grown and lived, consequently where sculpture production have been widespread. Turks living in Central and Asia Minor have made sculptures for different reasons in the pre-Islamic time. After the acceptance of Islam, sculpture with religious quality and worship purposes were prohibited. Since there was no prohibition against description of non-religious nature, it was especially possible to realize stylized plant, animal and human sculptures in Seljuk art. 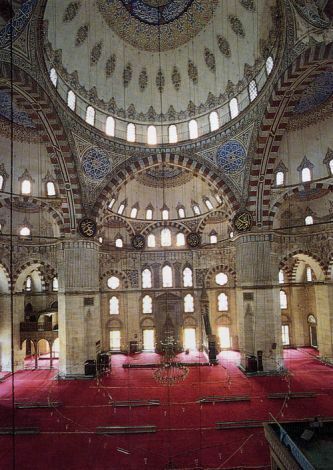 Although Seljuks developed a sculpture dependent of architecture, the classical period of architectural conception of Ottomans was based on simplicity, monumentalism, geometric and abstract forms. For this reason Ottomans stayed distant to sculpture that could take place in this frame until the ends of the 19th century. They had only produced sculptural examples in tomb-stones, marking stones and bow figures of lions. The first messengers of sculpture that appeared with a western understanding towards the end of the 19th century were relief marbles made with a naturalist style describing flowers arranged in vases or fruits in plates on public fountains in squares at the Tulip Period, beginning of the 18th century. Ottoman Sultans were pioneers of westernization movements in the culture of the Ottoman Empire in the 19th century. The example is Sultan Abdulaziz, in 1871, having C.F. Fuller, a sculptor brought from Europe, make his sculpture on horseback and animal sculptures to be put in the gardens of the palace. During the same period we come across to reliefs with human figures and sculptures in buildings built in Beyoglu, a westernized district of Istanbul, showing a parallel style with the contemporary European architecture. An exhibition of Italian wax sculpture was opened in Beyoglu in 1882. Human size examples of important people of the time and of historical characters were shown at the exhibition where the public was able to see them with a fee. The acceptance of sculpture as part of art in Turkey in modern sense is realized in 1883 with the founding of Sanayi-i Nefise Mektebi Alisi / School of Fine Arts. Osman Hamdi Bey was the founder and first principal of the school. Sculpture, that was less popular compared to painting,found the possibility of development after this date within the environment of the school. Yervant Osman Efendi (1855-1914) who got his education in Italy and France took part in starting of the department of sculpture and was appointed as teacher of this department when the School of Fine Arts was founded. This institution followed the model of Western academies and was based on European culture, being the only school in Turkey that gave education in sculpture for many years. Ihsan Ozsoy (1867-1944) shared the same naturalist style with his teacher Osgan Efendi, one of the first sculptors of Turkey. He was sent to Paris by the government. The artist participated in the 1893-1894 Paris Exhibitions of Fine Arts, returned to Istanbul in 1895 and was asked to teach sculpture at the Academy in 1908. Isa Behzat (1875-1916) who was a student of Osgan Efendi and Mehmet Mahir Tomruk (1885-1954) who was educated at Munich Fine Arts Academy and whose works showed influences of the German school took place among sculptors who completed their artistic formations before the Republic. 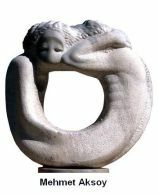 Nijad Sirel (1897-1959) is another sculptor graduated from the Munich Fine Arts Academy at the same period. Ratip Asir Acudogu (1898-1957), Ali Hadi Bara (1906-1971), Zuhtu Muridoglu (1906-1992),Nusret Suman (1905-1978), Yavuz Gore (1912-), Huseyin Gezer (1920-), Mehmet Sadi Calik (1917-1984), Ilhan Koman (1923-1986) took their place among the first artists of the Republican generation. At the same years the appearance of women artists such as Sabiha Bengutas (1910-), Nermin Faruki (1914-? ), Zerin Bolukbasi (1928-) and Lerzan Bengisu (1906-?) demonstrates the changes and modernization of the Republican Period. The staff of the Fine Arts Academy was reinforced with new members parallel to contemporary understandings identifying with the cultural life of the Republican Period. German sculptor Rudolf Belling (1886-1972) was invited to Turkey to be a teacher of the sculpture department in 1937 with this point of view. Other than Belling, Austrian Heinrich Krippel (1883-1945), Anton Hanak (1875-1934), Italian Pietro Canonica (1869-1962), German Josef Thorak (1889-1952) were asked to realize Ataturk monuments in Turkey. Monument of Victory in Ankara, Monument of Ataturk on Horseback in Samsun, Monument of Victory in Afyon by Krippel; the Monument of Ataturk on Horseback in front of the Ankara Etnography Museum and the Monument of the Republic in Taksim, Istanbul by Canonica; the Monument of Trust in Ankara by both Hanak and Thorak are the major works. These Monuments took their places as examples of "official art" in Turkey and were models to many Monuments of Ataturk? produced in the 1970's. The first generation which stayed away from the "official art" of the Turkish sculpture and made individual experiments, included artists who had understood the contemporary aesthetics: Hadi Bara, Zuhtu Muritoglu, Nusret Suman, Sadi Calik, Ilhan Koman. Tendencies of abstract art were observed for the first time in the works of Hadi Bara in 1948-50. Hadi Bara and Zuhtu Muritoglu brought in fresh breath to the education of sculpture education and raised students with concepts of contemporary art at the Academy of Fine Arts where they took part as teachers in the beginning of the 1950's. Graduates from their studios besides Kuzgun Acar (1928-1976) who was successful with his metalic structures but died young, Ali Teoman Germaner (Alos) (1934-) who investigated relations of structure-form-meaning in his works, Gurdal Duyar (1935-) and? who were inclined to expressive forms, Fusun Onur (1937-) who made conceptual studies and Tamer Basoglu (1938-) who worked in abstract line still maintain their influence today. Among these artists , sculptors such as Basoglu, Germaner, Duyar tried to take monumental sculptures beyond the limits of the "official art" and carry the experience of their artistic experiments onto this area. Sculptors who preferred abstract forms in Turkey in the 1960-1970's were interested in the problems of form, materials and structure, and worked with an understanding parallel to the development of the Western sculpture post-1945. Sadi Celik tried to realize his minimalist forms with construction iron, chromium and nickel. Mehmet Aksoy (1939-), a student of Sadi Calik, who adapted an understanding of an expressive figuration in his large size sculptures from rock and marble; Saim Bugay (1934-) with his stylized forms that he created collected materials from wood and metal; Koray Aris (1944-) with him bringing a new explanation to the human form with leather and stout leather are of interest. Huseyin Gezer gives importance to geometry and harmony in his sculptures. His monuments are also interesting in that he has preferred dynamic compositions in them. An important improvement of post-1970 sculpture in Turkey compared to the previous periods is observed in consequence of exhibitions in galeries, open air activities of sculpture, symposium and Biennial in Istanbul. 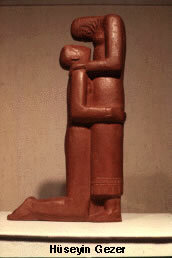 Activities of woman sculptors deserve consideration. The economics of Turkey in the 1980-1990's fed the art milieu and sculpture also took his share. The major young Turkish sculptors are Seyhun Topuz (1942-), Meric Hizal (1943), Erdag Aksel (1953-), Ferit Ozsen (1943-), Nur Tarim (1947-), Salih Coskun (1950-),Cengiz Cekil (1945-), Rahmi Aksungur (1955-), Hayri Karay (1952-), Handan Bortucene (1957-),Isilar Kur, Server Demirtas, Metin Haseki, Hayri Koray, Yunus Tankus, Fatos Akagun, Mumtaz Isingor, Fusun Onur, Umit Ozturk, Nevzat Atalay, Aytac Marmara Kati, Vedat Somay, Ali Osman Avsar, Lale Cavuldur, Ziyatin Nuriev, Ertug Atli, Selma Gurbuz, Adem Yilmaz, Hakki Karayigitoglu,Tankut Oktem, Yavuz Gorey, Selma Gurbuz, Ayse Erkmen, Aydin Askan, Namik Denizhan, Gulsun Karamustafa, Huseyin Anka Ozkan, Ertug Atli, Ayla Aksungur, Ferit Ozsen.